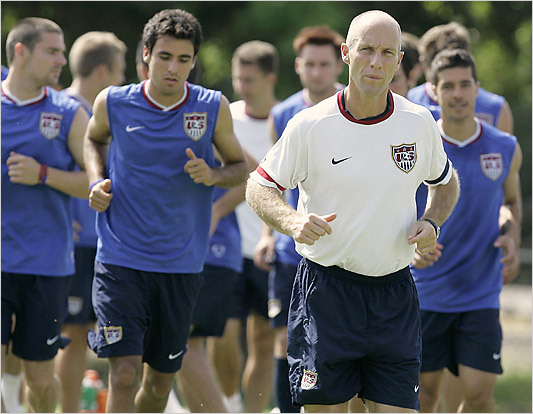 Bob Bradley’s departure as USMNT boss marks FFG’s first “changing of the guard” since our inception prior to the 2010 World Cup. In that sense, it is a bitter sweet transition and, although we’ve quickly shifted our attention to our new focus, Jurgen Klinsman, we didn’t feel right not providing a little montage of our coverage of Bradley over the last year. Even though we never let Bob off the hook easily when USA underperformed, there was always an undertone of intellectual and tactical respect for a man who loves and reveres the game with as many neurons as we do. In other words, he’s a thinking man–a true student of the beautiful game who treats his next match with the same care and introspection with which a doctoral student prepares her next essay. That being said, he didn’t always turn in “A” papers, despite his best efforts. There are some classic miscues that will forever mar our memory of his tenure. One we still can’t seem to shake is his decision to start Ricardo Clark as a holding midfielder vs. Ghana in the World Cup quarterfinals. Clark’s glaring error allowed Boateng to bag an early goal and psychologically damage an emotional US. Bob also had a terrible tendency to blow comfortable leads in REALLY IMPORTANT games. As in silverware games! Think the 2009 Confederations Cup final and, more recently and even more painfully, this summer’s Gold Cup final vs. Mexico. Yet despite these downfalls, we can’t deny that some of US Soccer’s most memorable moments have come on Bradley’s watch as well. Notwithstanding the two blown leads mentioned above, Bradley was a master adjuster, and his second half tactics were generally smart and effective. For this reason we fans came to expect strong, sensational and emotional finishes, including Donovan’s “Hollywood” heartstopper vs. Algeria. I’ll be honest–I’m not Landon’s biggest fan, but I think I’ll always love him and Ian Darke (the Englishman who made the call for ESPN) for the goosebumps I get every time I see and hear that clip. Abby Wambach’s 122nd minute equalizer vs. Brazil is probably the only other contender for US Soccer’s “goal of the century” so far. Bob will be inextricably linked in US soccer history with the 4-4-2, and we have covered his use of it extensively. At times he seemed like a genius maximizing results with the squad he had available. At other times his 4-4-2 seemed more like a relic he’d become dogmatically attached to. FFG suggested as far back as summer 2010 (during the World Cup) that he should consider a tactical shift to the now highly popular 4-2-3-1. After the World Cup he did begin to flirt with more creative formations, of course, and by this summer’s Gold Cup he was, indeed, comfortable with the 4-2-3-1. Too little, too late, as they say. The heart of Bradley’s time at the USMNT helm was the 2010 World Cup, and you can find a wealth of analysis, statistics and opinions in our 2010 Retrospective series. That competition was representative of Bradley’s career: full of remarkable achievements, yet we still felt as if there could have been more. Before we all make the transition to a new era of US Men’s Soccer, we’d love to hear from you, readers. Do you feel we’ve given Bradley a fair shake over the years? Has he progressed the beautiful game for us in the right direction? Numbers and stats aside, how will you remember Bob? Even though I always got frustrated with his opening tactics and then rejuvenated by his 2nd half changes, it was an opposite set of decisions that will remain seared in my mind. In that ’09 Confederations Cup final, he instructed the team to sit back when the 2nd half started (USA was, of course, up 2-0 at that point). From that moment on, they never had a chance. The last 45 minutes consisted solely of Brazil attacking and Tim Howard punting the ball right back to them. At the end of the first half, I’d never felt so excited about a USA game. By the end of the second, I thought I’d never experience that feeling ever again. For me, that’s Bob in a nutshell.